Global Call Forwarding provides local, mobile, and toll free numbers around the world along with a variety of services to complement the telecom needs of your business. With over 20 years of experience, it is our passion to provide a reliable and high-quality call forwarding service and virtual phone system to our valued customers. We currently serve thousands of clients in over 140+ countries around the globe, ranging from individuals to small and medium-sized businesses and even multinational corporations. Using our virtual phone systems control panel, you can set up easy to use extensions that users can dial when they call your new number (Press 1 for sales, press 2 for marketing…etc.) for a user friendly and professional experience. Be connected to your customers and communicate as efficiently as possible by adding SMS to your new number. Easily forward incoming SMS messages to any email address. Try Global Call Forwarding for free with our instant activation free trial. Free call forwarding offers the opportunity to experience the features and benefits of our call forwarding service for a short time. Cancel the service at any time without any ongoing contracts or commitments. No pressure! 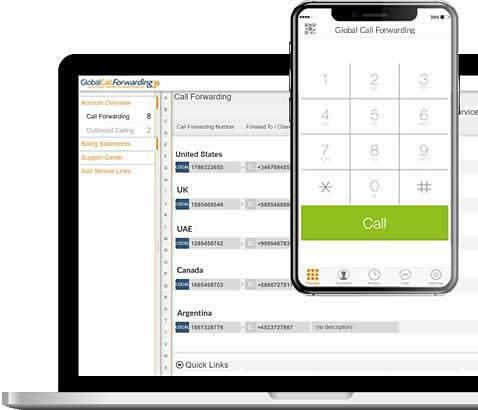 When you purchase a virtual phone number from Global Call Forwarding in any of the 140+ countries where we have availability, you can instantly forward incoming calls to any other phone number or VoIP / SIP line in the world. Using our outbound calling feature, you can also make outgoing calls from that number with the corresponding caller ID. We give our customers access to an advanced online control panel where you can manage a large number of features using a simple, easy to use interface. 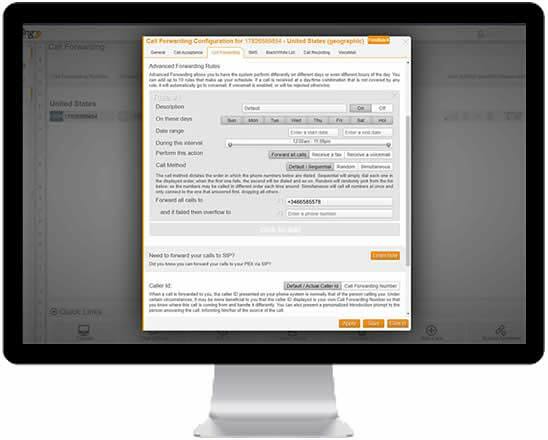 Some of the features included with our virtual phone system are call forwarding rules, adjustments to ringback tone, greetings, time of day routing, sequential forwarding, failover forwarding, caller ID settings, introduction prompts, SMS deliverability settings, incoming fax settings, blacklists (and whitelists), call recordings, voicemail, and more. We are the leading provider of international toll free numbers available in countries across the world. Our international tollfree service is used by thousands of companies including multinational businesses with operations in regions across the globe. Need an enterprise solution for your business? We can provide you with a custom proposal of services, designed just for you! Fill out the form on our corporate inquiries page and an account manager will be in touch with you. You can also call us at any of the numbers on the top of our website.